Larienna Macrina is an Imperial crusader who has been hunting a Daedroth named Hrelvesuu. She has finally cornered her in the ruins of Nchurdamz and has contacted the Fighters Guild for help in finishing her once and for all. Larienna is an accomplished fighter and is also capable of healing you during the related quest. Once Hrelvesuu is dead, Larienna will remain at her final location, and can be approached should you ever need healing again in the area (though her spell for this is weak). She is wearing a near full set of Imperial Steel armor, including the cuirass, both pauldrons, both gauntlets, greaves, boots, and shield. She is also wearing a pair of expensive pants, she is wielding a steel flamesword, and she is carrying two quality restore healths, two quality restore fatigue, two quality restore magickas, and 50 gold pieces. 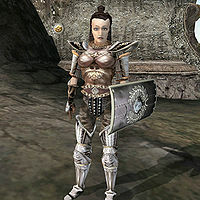 Aside from her natural charm and ability to absorb fatigue from others, she knows the following spells: Deadly Poison [Ranged], Weakness to Blight Disease, Weakness to Corprus Disease, Dire Weakness to Fire, Dire Weakness to Frost, Dire Weakness to Magicka, Dire Weakness to Poison, Dire Weakness to Shock, Daedric Bite, God's Spark, and Heal Companion. She is one of very few people in Morrowind (before the expansions) that has unique audio dialogue. She uses strong area-of-effect spells on enemies, and, if you are not careful, it is entirely possible for her to kill a low-level player character in one hit if you do not stay out of the way (or are actually fighting her). After finishing the quest, Hrundi will tell you that Larienna has left Vvardenfell because of "unfinished business". Despite this, she will actually still remain in Nchurdamz. Despite her race being an Imperial, her unique dialog uses the female Breton's voice actress while still using the regular imperial voices for generic dialog. It's possible she was originally planned to be a Breton at some point and changed to an imperial but thevoiceovers weren't updated accordingly. This page was last modified on 23 November 2018, at 06:23.